"its a major award!!" "fraageelay"
"i want an official red ryder carbine action two hundred shot range model air rifle, ow!" "show me how the piggies eat"
"daddy's going to kill Ralphie!" "do you know what your son just said!?" 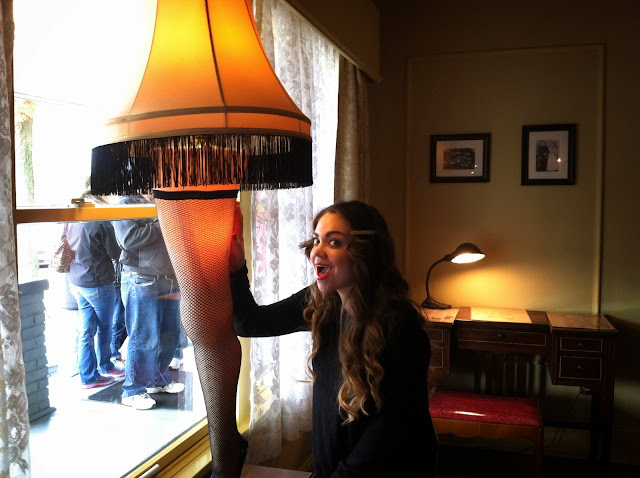 So our family is obsessed with the movie A Christmas Story. We always wanted to go to tour the real house from the movie ever since we found you actually can! This past weekend we packed up and drove up to Cleveland, Ohio to finally make it happen! If you are a true fan of the movie this experience is incredible. You get to go around thru the whole house reenacting scenes and taking photos how ever you want! You can touch anything and everything! We even got to meet the actor from the who was the man that delivered the leg lamp. After all the fun we had taking photos in the house, and picking up our very own leg lamp in the gift shop we had some lunch. The chinese restaurant that is in the very end of the film is right around the corner from the house, so of course we had lunch there!! We went out around Cleveland for a little while then went back to the hotel to relax. Before we headed downtown to go into Little Italy for dinner, we drove back past the house so we could take photos of it in the dark with the lamp shinning thru the window. After taking more pictures we went downtown, Little Italy was such a cute tiny strip of restaurants and cafe. We ended up getting different flatbreads, and a cheese platter to share at a family owned wine bar. After eating we walked around that section and had cannoli's and pumpkin gelato at an italian bakery. This weekend was too much fun and a dream come true to walk thru the house of one of my favorite movies ever!